There's no need to travel far once you arrive at Balangan, there's so much to do and see close by. The village of Rock is set on the Camel estuary frequented by sailing, surfing and golfing enthusiasts. It is ideal for all generations. Golden sands stretch north to Daymer Bay and South to Porthilly Cove, which is within walking distance of Balangan. We are situated in a quiet position on the edge of the village and approached by a private lane that runs on across the golf course onto the coastal path. This path will lead you to the beach at Rock where you can get the ferry over to Padstow. Those who would like a good walk follow the beach at Rock along to Daymer Bay, Polzeath and keep on walking on through Port Quin and up to the quaint fishing port, Port Isaac, and treat yourself to a cream tea or a pint of Doom. Theres a nice short circular walk through the famous links golf course of St Enodoc to the crooked-towered church where Sir John Betjeman is buried, and the golden sands of Daymer Bay then back along the beach to Rock taking in Porthilly beach where there is a beautiful church right on the waters edge. During the summer, sailing, waterskiing and fishing trips are available in Rock, while year-round, surf beckons at Polzeath. There’s a wide choice of restaurants, among many others there’s The Dining Room which is just a 5 minute walk, Nathan Outlaw in Port Isaac, Rick Stein at Padstow or Jamie Oliver at Newquay to the many character village pubs serving local produce. Or return to Grass Court for a barbecue on the secluded patio and relax in the garden. Beautifully designed, the property has distinctive character features whilst maintaining an informal, spacious and contemporary style. Inside, the mood is a relaxed combination of old and new furniture and local art works. The slated hallway leads straight into the open plan kitchen/dining room and through a wide passage to the polished wooden floored sitting-room with woodburner and French doors to the patio and enclosed garden. The cottage is attached to 2 rarely used artist studios. Both ensuites have a shower, wc, basin and the twin bedroom has a bath as well. There is another wc and basin on the ground floor. Grass Court is in a rural location where internet connection is not as reliable as it would be in a town. If it is essential you have internet please bring your own dongle or similar. The slated hallway leads straight into the open plan kitchen/dining room and through a wide passage to the polished wooden floored sitting-room with woodburner and French doors to the patio and enclosed garden. St Enodoc Club House is just along the Rock Road, the Holywell Course is very close to the property with the Church Course next to that. There are many more courses in the area, the Point at Polzeath (formerly Roserrow) and St Kew being the closest. We had a brilliant week long stay over the Feb half term. Location is brilliant for Rock, Daymer Bay and Polzeath-There are loads of coastal paths to walk/run and the scenery is beautiful. Padstow is a boat ride or drive away but more locally there are brilliant pastries from Fee’s & pasties from Malcom’s! Shops are really close for the essentials. Would definitely come again. We visited this property fo the second time this year. It is a light and airy property , comfortable , clean and has all the features we required ie two en suites, plenty of space . Well placed for the shops and access to easy walking footpaths . Located in the heart of Rock village this cottage delivers on many fronts. It spacious and practical with ensuite to both bedrooms. If you stay ensure you take time to walk across the golf course to St Enodoc Church and make you way back up the estuary. Very comfortable and clean ...and spacious ...we enjoyed our stay because the furniture was so practical and user friendly.nice quiet spot and yet near to shops and beach.Would definitely go there again! A comfortable house with a double and twin bedrooms, both en-suite. The property was ideal for our sailing holiday with plenty of parking space and a large airing cupboard for drying kit. Good outside space for the barbecue we held. Had a great holiday here with our 2 kids. How house was nice and light and airy, 2 large bed rooms both with on-suite bath rooms and plenty of parking. Had everything we needed. The house is down a quiet lane. It is a short walk from a Spar, lovely bakery, butchers, deli and a fish and chip shop. Polzeath is great for surfing and Daymer Bay for younger kids. A walk along the Rock Road takes you to the beach at Rock which is a fabulous sandy beach which goes all the way along the estuary to Daymer Bay. From Daymer the coast path takes you to Grenaway Beach with huge rock pools, then a bit further on the coast path takes you to the popular Polzeath surfing beach. You can also take the ferry at Rock to take you over to the vibrant Padstow where a short walk takes you to some lovely secluded beaches. 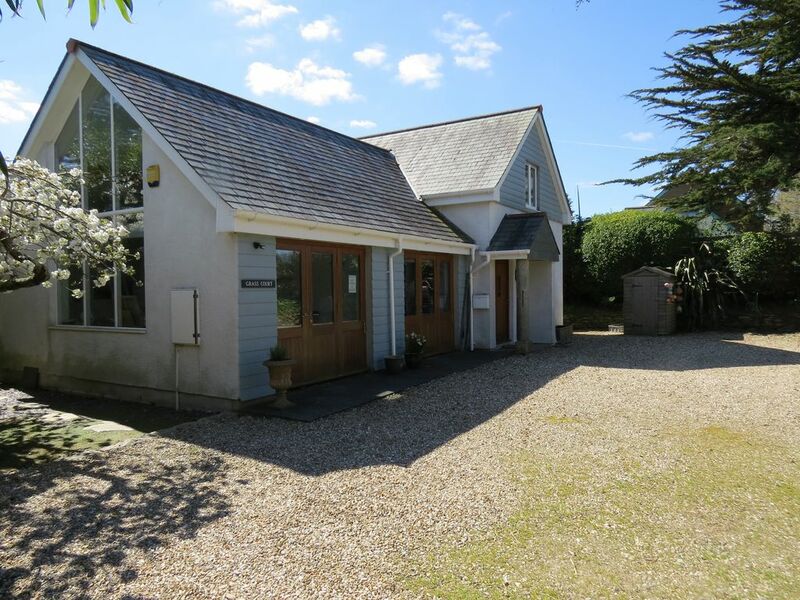 There is everything you might need on your holiday in the village of Rock and via the ferry to Padstow and maybe by hiring a bike to Wadebridge and Bodmin along the camel trail, but if you do want to drive there are some lovely villages and places of interest nearby. Port Issac is famous for the Doc Martin series and the Fisherman’s Friends who sing on the Plat most Fridays during the summer. The Eden Project, the Lost Gardens of Helligan and Boscastle are well worth a visit.